Close to downtown Denver with easy access to public transportation and roadways, Gates East is a mixed use development located on the revitalized site of the Gates Rubber Factory. After 85 years of producing belts, hoses and tires for the automotive industry, the site underwent an extensive clean-up and revitalization effort. The development’s initial phases kicked-off by establishing city streets and a four-story parking deck. The deck is in the center of the Gates East development and is wrapped by apartment units. 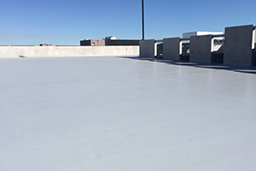 In order to live up to the anticipated demands of daily vehicle use and Denver’s unpredictable weather, the developers at The Lionstone Group chose to safeguard their investment with Tennant’s Eco-Flex™ Deck system. 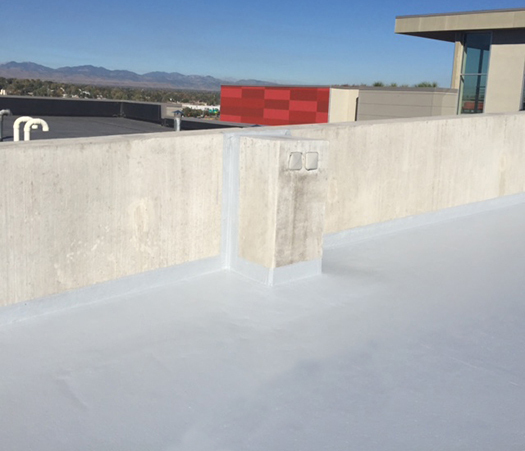 Eco-Flex™ Deck system creates a seamless waterproof deck that withstands harsh chemicals, is slip resistant in wet conditions and cleans up easy. 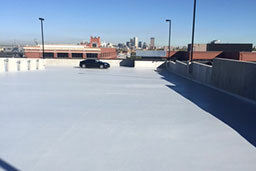 Eco-Flex™ Deck System – A durable three coat aliphatic parking deck coating system that repairs eroded or sloped areas, provides a slip-resistant texture to help prevent accidents in wet conditions while withstanding extreme temperature, chemical exposure and vehicular traffic. Maximize the natural life of your deck with our Eco-Flex™ Deck System.